Chris has been selected to receive the 2018-2020 Presidential Teaching Fellow Award. This award carries with it the University's highest teaching honor and serves as recognition of his tremendous contributions as a teacher to the University of New Mexico and our department. Jami has been selected to receive the 2017-2018 New Teacher of the Year Award. 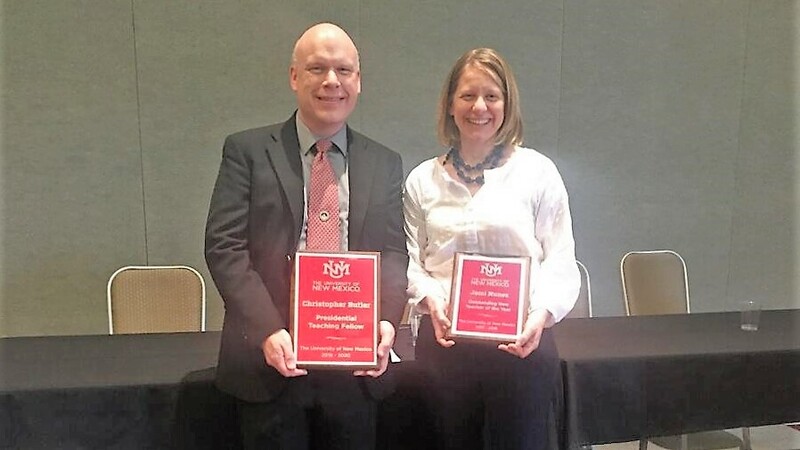 The award carries with it high honor and serves as recognition of her valuable contributions as a classroom instructor and leader at the University of New Mexico and our department. An award ceremony will be held on Thursday, May 3, 2018, in SUB Ballroom C. We encourage you to come support and celebrate Professor Butler and Professor Nelson-Nunez as they receive their award and recognition for their excellence in teaching.